So many companies claim to have 24 hour emergency service, but do they really? Many instances customer will tell us that they had some sort of an issue, called a few contractors and either no one called them back, or they tried to offer their service the next business day. I can not emphasize enough that when a water loss occurs in a home, removing the water and drying the structure as soon as possible is imperative. It not only reduces the chance of microbial growth, but it also can potentially save items and materials which were involved in the loss. 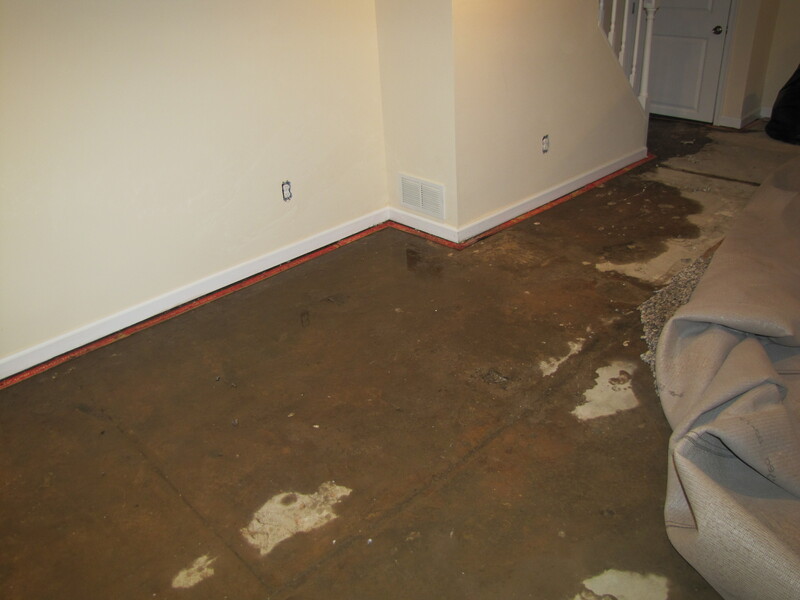 Pictured here was a basement where a hot water tank burst and did significant damage. The home owner called several companies who didn’t respond, and then he called us. We were there within an hour and were able to save personal items that were wet and the carpeting. In conclusion, many companies will claim 24 Hour Emergency Service because it attracts potential clients, but insuring your contractor does offer the service when needed can save you thousands of dollars when a loss occurs. Allergic symptoms. Exposure to large amounts of Aspergillus spores can cause allergic reactions. People with severe asthma are often sensitive to Aspergillus and can suffer asthma attacks because of the spores. Toxic symptoms. These are caused by the mycotoxins produced by some species of Aspergillus, especially Aspergillus flavus. One such mycotoxin is aflatoxin, a very potent carcinogen. Infection. Aspergillus species can infect people and animals and begin to grow inside them, especially in the lungs. Usually only people with weakened immune systems are susceptible to infection by Aspergillus. Aspergillus infections are categorized in the group of diseases called Aspergillosis. Allergic bronchopulmonary aspergillosis (ABPA) is a disease where a person’s immune system is hypersensitive to Aspergillus spores. This hypersensitivity causes allergic reactions in the person when they are exposed to Aspergillus as the immune system tries to expel the spores from the body. People with cystic fibrosis or asthma are especially vulnerable to Allergic bronchopulmonary aspergillosis, with approximately 5% of asthmatics suffering this disease at some point in their life. Allergic bronchopulmonary aspergillosis is usually caused by Aspergillus fumigatus. Tests for allergic bronchopulmonary aspergillosis can be performed through x-rays, skin tests or blood tests. The treatment for allergic bronchopulmonary aspergillosis is for steroids to be taken through mouth or nasal spray. An antifungal drug called itraconazole can also help to treat the disease in conjunction with steroids. Aspergillus is a group of molds, of which about 200 species have been identified. Aspergillus molds are found throughout the world and are the most common type of fungi in the environment. About 16 species of Aspergillus molds are known to be dangerous to humans, causing disease and infection. Aspergillus niger is the most abundant species of Aspergillus in nature as it can grow on a large variety of substances. Aspergillus niger can even grow in environments with very little nutrients available. In houses it is often found growing on damp walls. Of the Aspergillus species, Aspergillus niger infects humans the third most often. A fungal ball in the lungs is eventually created by Aspergillus niger after it infects a person’s lungs and begins to grow. The health effects of Aspergillus niger include hearing problems and even hearing loss. Aspergillus niger is black on the surface and white or yellow underneath. Aspergillus flavus produces the carcinogenic mycotoxin, aflatoxin which often contaminates foods such as nuts. After Aspergillus fumigatus, Aspergillus flavus is the second most common Aspergillus mold to infect humans. The surface of Aspergillus flavus is yellow-green in color and it is gold or red brown underneath. Aspergillus fumigatus causes infection in humans more often than any other Aspergillus species. People who handle or who are exposed extensively to Aspergillus fumigatus often develop a hypersensitivity to it so that they develop severe allergic reactions to the mold. Aspergillus fumigatus is often found growing in decomposing organic material. Of all the Aspergillus species, Aspergillus fumigatus is the most tolerant to temperature and can grow in environments between 20 degrees Celsius and 55 degrees Celsius. Aspergillus fumigatus can be identified by the blue-green or gray color of its surface and appears white or tan underneath. For more information, visit our website at Biowashing.com & check back for Parts 2 and 3.